If you look around yourself you get to see only monstrous buildings. There are hardly any trees. All those of you from Bangalore would agree that this was not the case some years back. How about starting a Green Initiative? If you have space around your home how about planting a tree sapling or at least a plant. Just as the sapling needs water to grow, you need knowledge to grow. 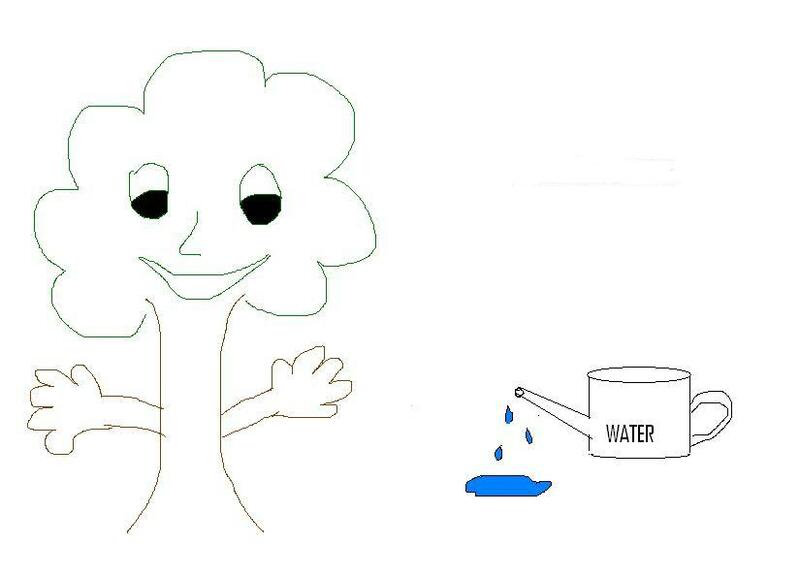 Water your brain with knowledge. Save some time in the weekend to learn something new. One fine day, your hard work will surely pay off. Your sapling needs protection from pest attacks. Keep away pests. Also build a hedge around her. Just as the sapling needs protection you need to protect yourself from pests too (read as negative thoughts and negative people). Always keep track of your baby (the sapling). As your sapling grows up you need to grow up too. Accumulate knowledge and become a reservoir of knowledge. Don’t just stop at accumulating knowledge, share it. As your little sapling grows into a tree, she will become a shade giver and you will become a knowledge giver. GO GREEN! AIM HIGH! PLANT MORE TREES! 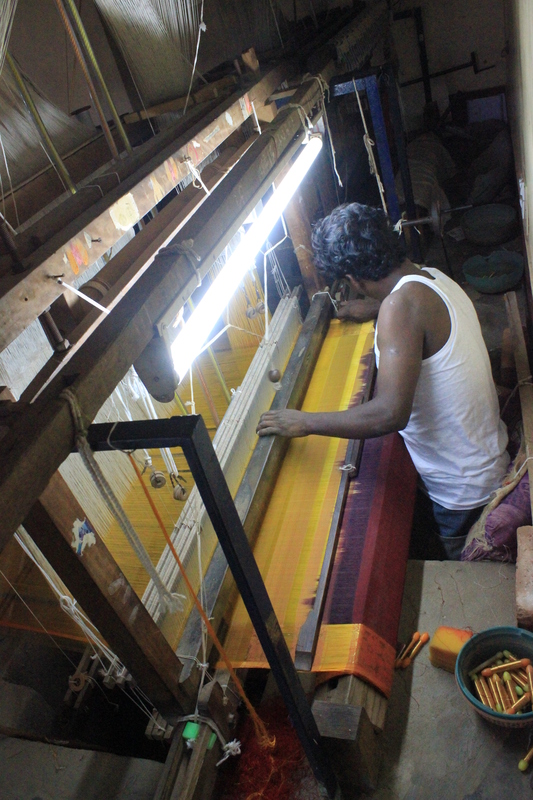 A journey to the land of silk-makers in and around Bangalore threw up a whole lot of surprises. 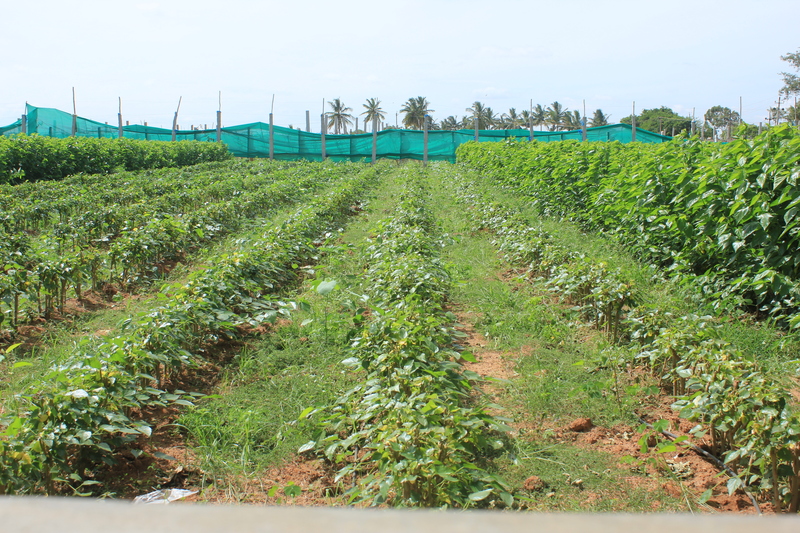 The trip organised by Carnelian, a company that organizes heritage tours and walks, revived memories of my class X Economics project which co-incidentally was on sericulture. If you thought the story behind the making of exquisite silk is as fascinating as the fabric, you couldn’t be more wrong. 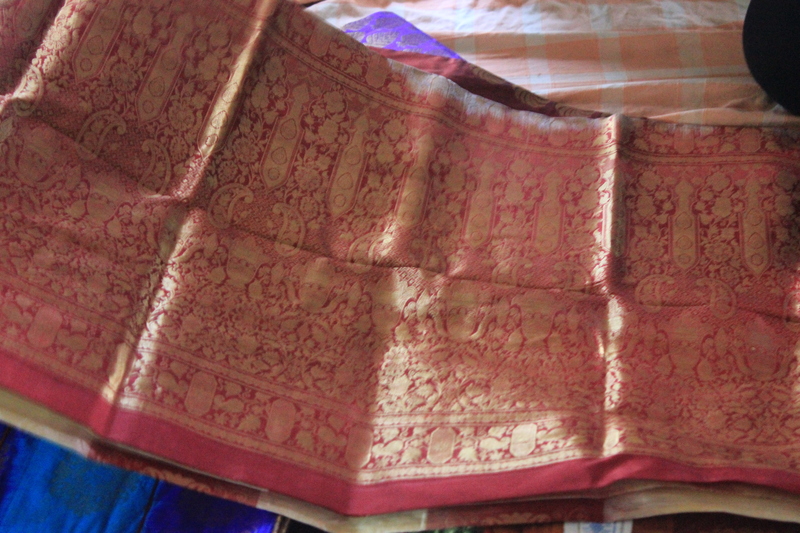 Behind every silk saree is the sacrifice of thousands of silkworms and the sweat and toil of hundreds of men and women. 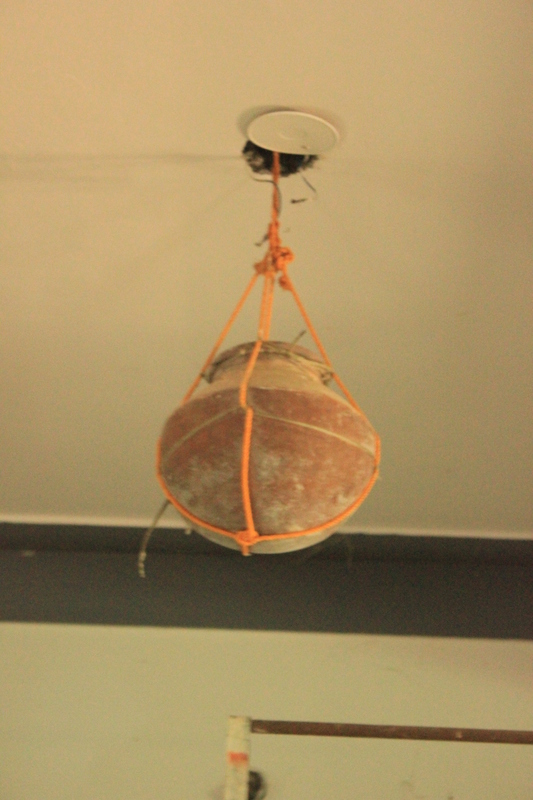 An indigenous method of controlling temperature – An earthen pot containing water suspended from the roof. We set off on a bright Saturday morning to Vijayapura, a town outside Bangalore. Our first stop was at a grainage. 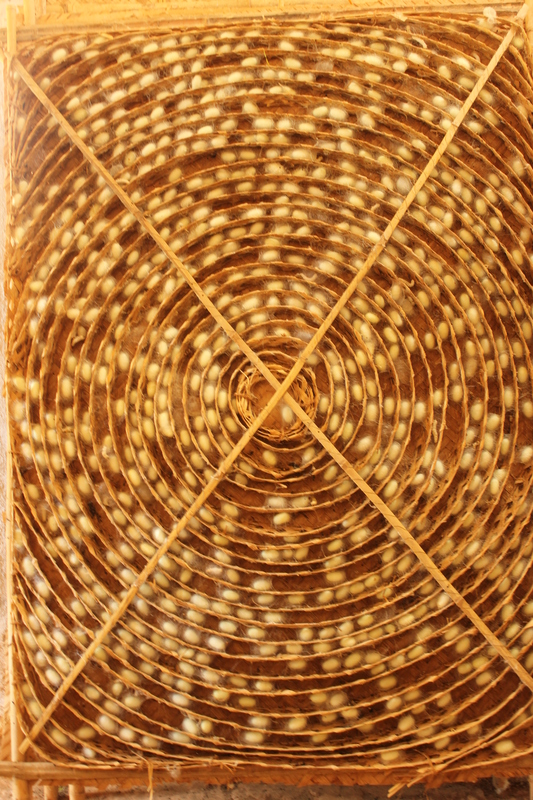 Grainages are temperature-controlled facilities where cocoons are kept under controlled temperature conditions till the pupa emerges from them as moths after about a week. 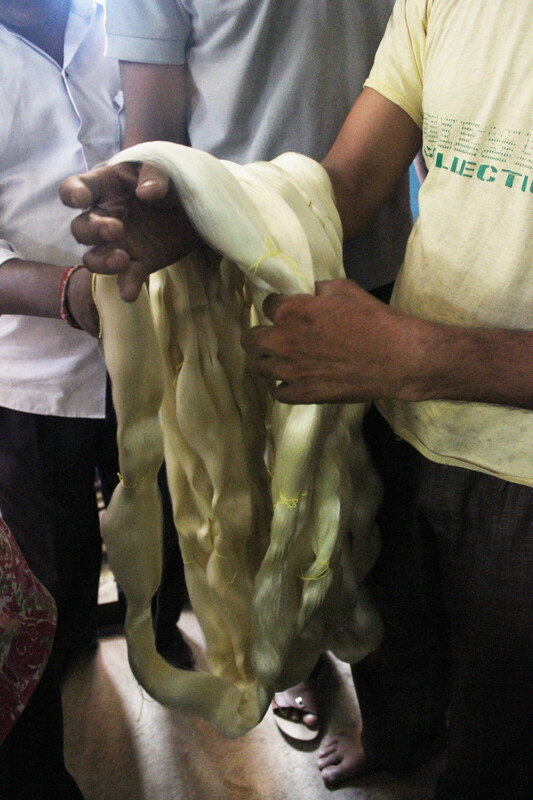 The Bombyx mori moth is the key player in the making of silk in Karnataka. 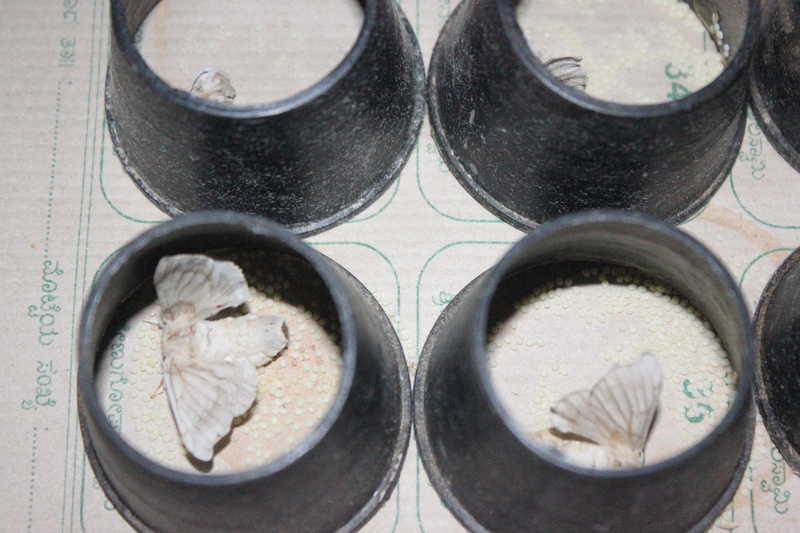 Female moths with eggs kept in a dark room. The grainage had cocoons of two hues – cream and white. Male and female moths are allowed to mate. 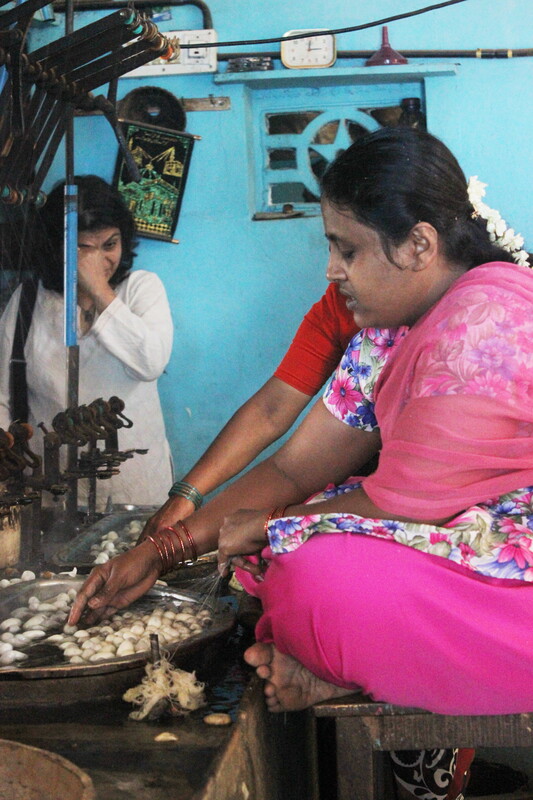 Mr Manjunath, the owner of the grainage mentioned that from the two varieties of cocoon they only pick the males from one and the females from another. A female lays around 400-500 eggs usually 48 hours after mating. Eggs hatch after 8 days. 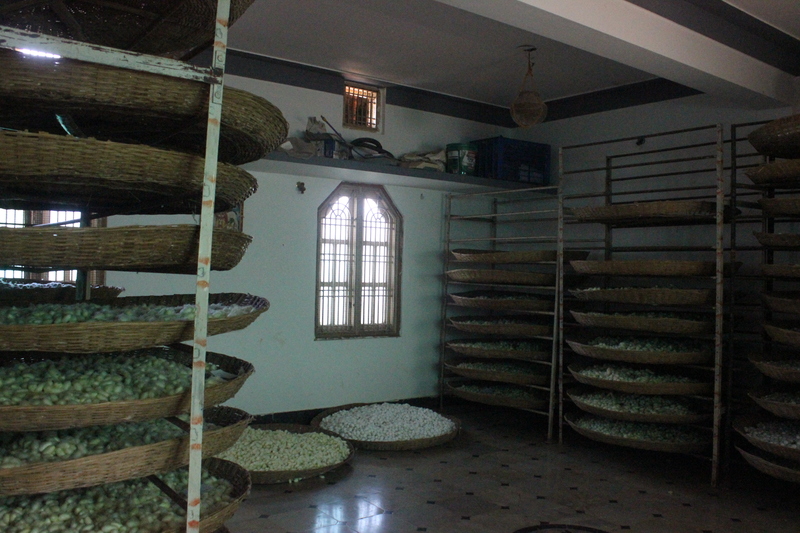 In case the demand for silk is less, the eggs are stored in a refrigerator to postpone hatching. Little worms that hatch from the eggs are then shifted to a larger facility called the chawki where they are fed tender mulberry leaves. 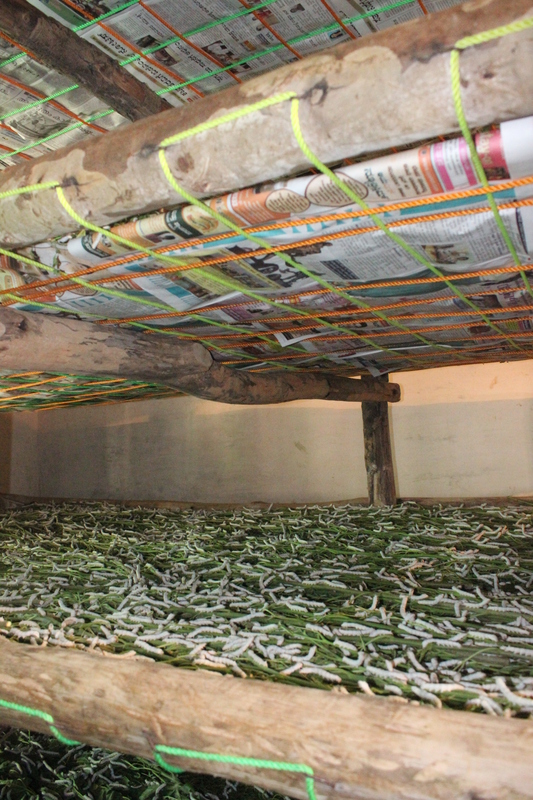 Cultivation of mulberry leaves and rearing of silkworms go hand in hand. The mulberry leaves are the only food of the silkworms. Worms have to be nurtured with utmost care. 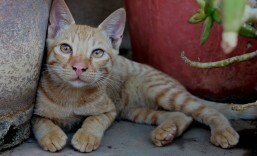 Feeding is done thrice a day – morning, afternoon and night. 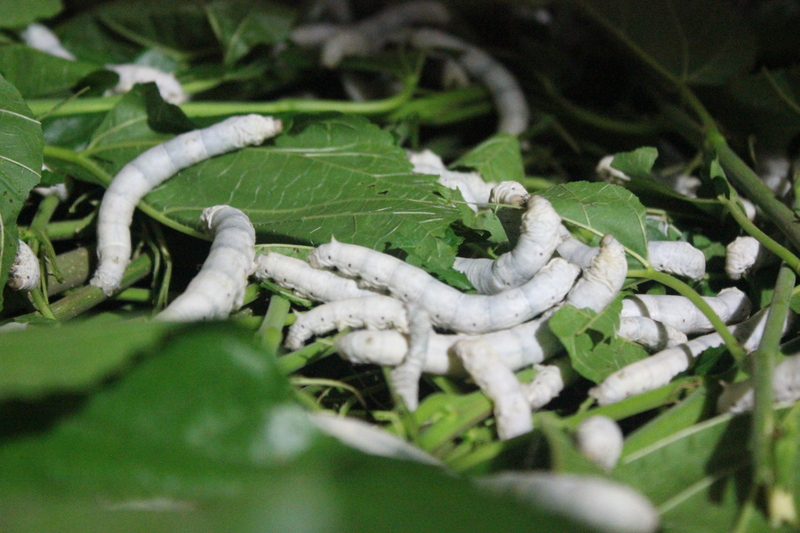 During their life-cycle, silkworms go through four moulting phases or instars. During a moulting phase, the worms shed old skin and acquire a new one. When in the moulting stage, which lasts for almost a day, the worms should not be fed. 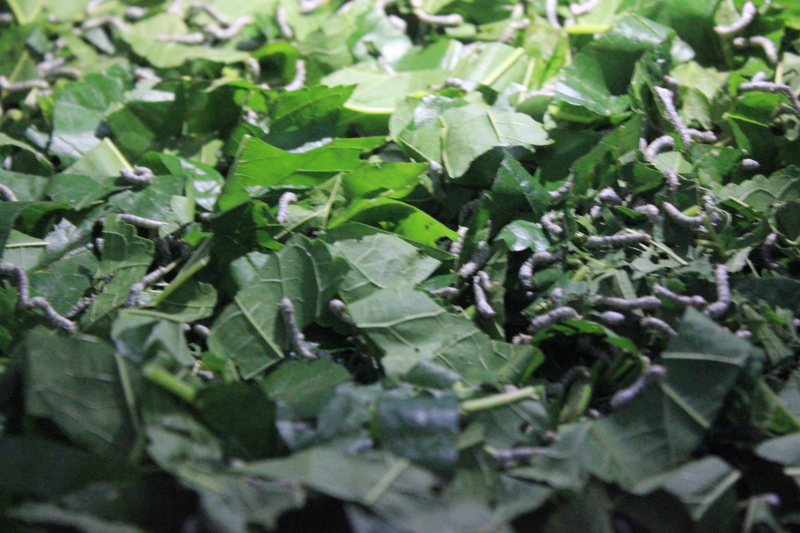 18- day-old silkworms feeding on mulberry leaves. Only the leaves are eaten and not the stems. 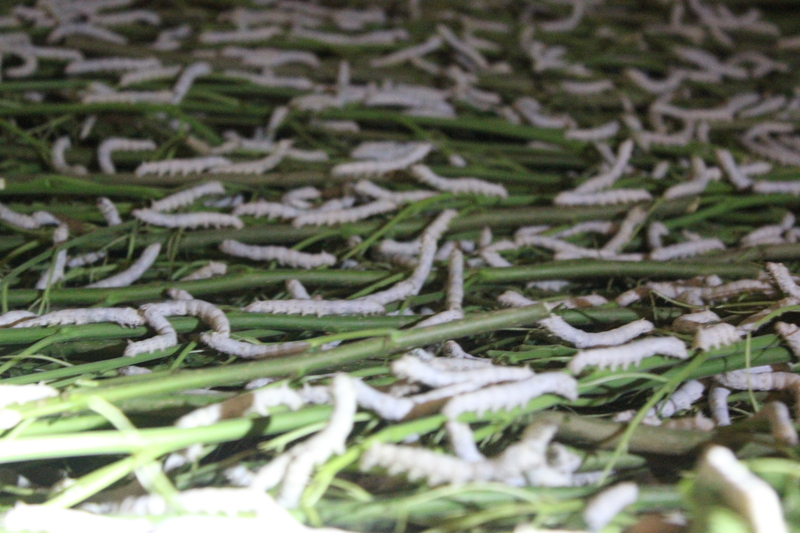 Rearing silkworms is no easy task! When they are about 18 days old, the worms are shifted to a larger facility and are fed mature leaves. 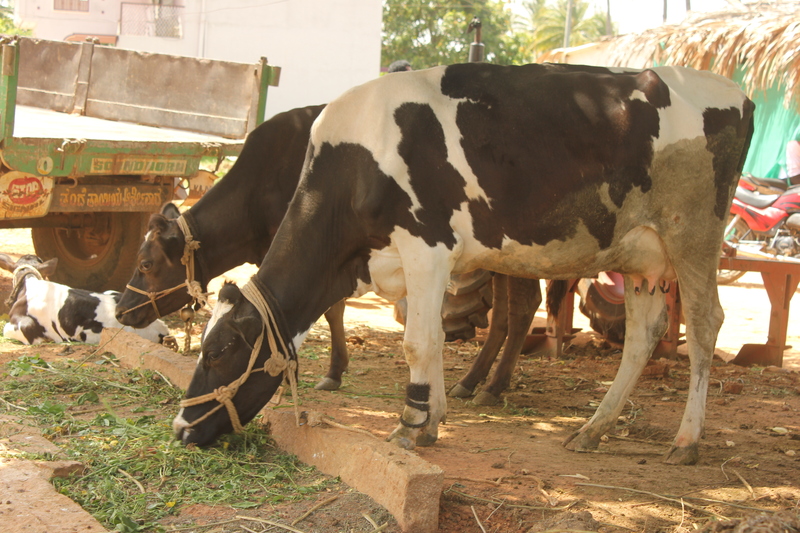 Stems of the leaves are fed to cattle. When the worms are around a month old, they are shifted to chakhris that are housed in a spacious facility. In the chakris the worms, which are considerably bigger in size now, spin fine silk cocoons around them. A day after the cocoons are formed they are transported to the cocoon market. We visited the cocoon market at Sidlaghata which we were told is open throughout the year except on Independence and Republic Day. A worker carrying a huge bundle of cocoons to the reeling unit. The cocoons were vanishing from the market at a steady rate. 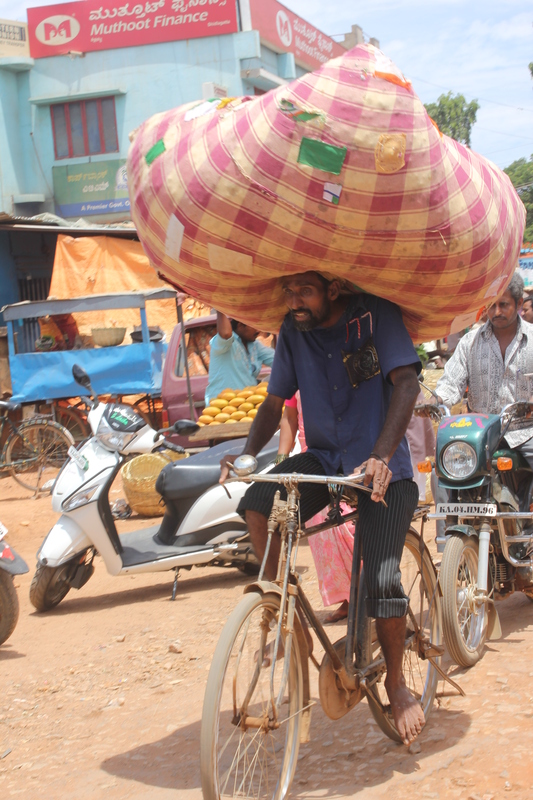 The buyers, most of them cycle-bound, were carrying huge bundles of them to the reeling units. The reeling units that we were shown into at Sidlaghata had hand-operated machines. 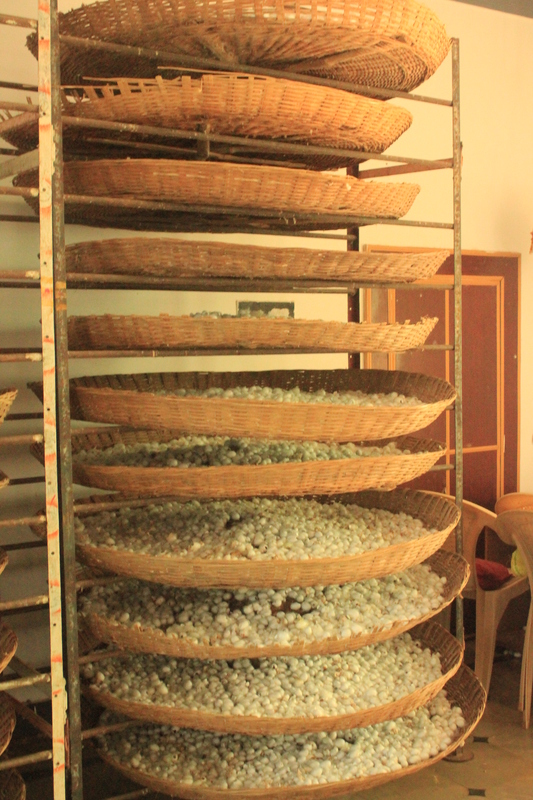 In the reeling units, the cocoons are dipped in boiling water to facilitate easy extraction of silk filament. During this process the worms, which have now entered the pupa stage, perish. Many would be wondering why the pupae have to meet with such a gruesome end. 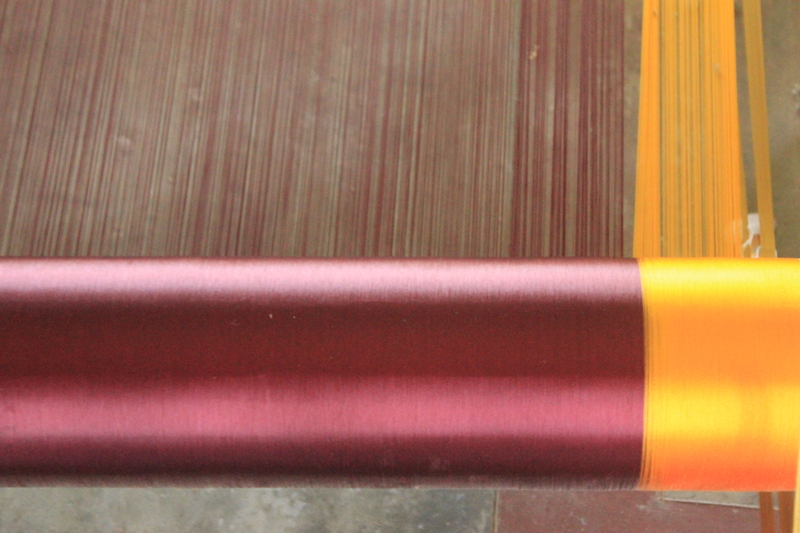 The idea is to produce exceptionally high-quality silk. 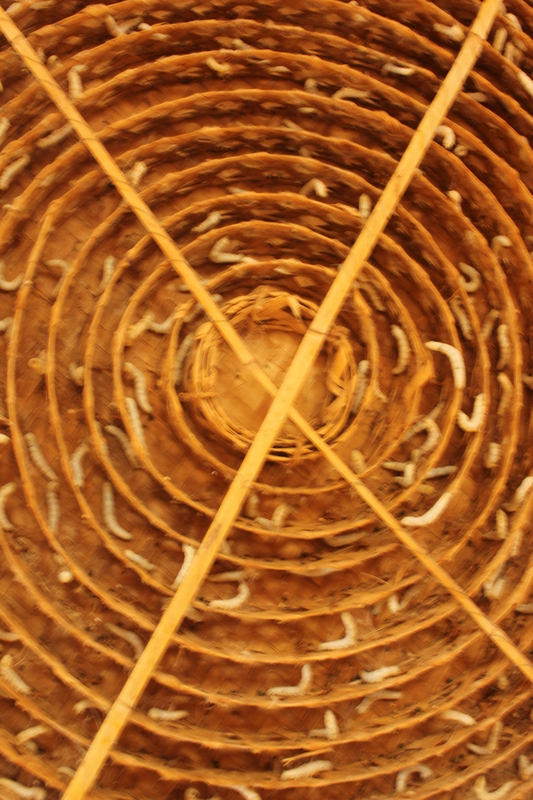 If the pupae turn into moths and emerge from the cocoon, the silk strand breaks resulting in multiple segments. 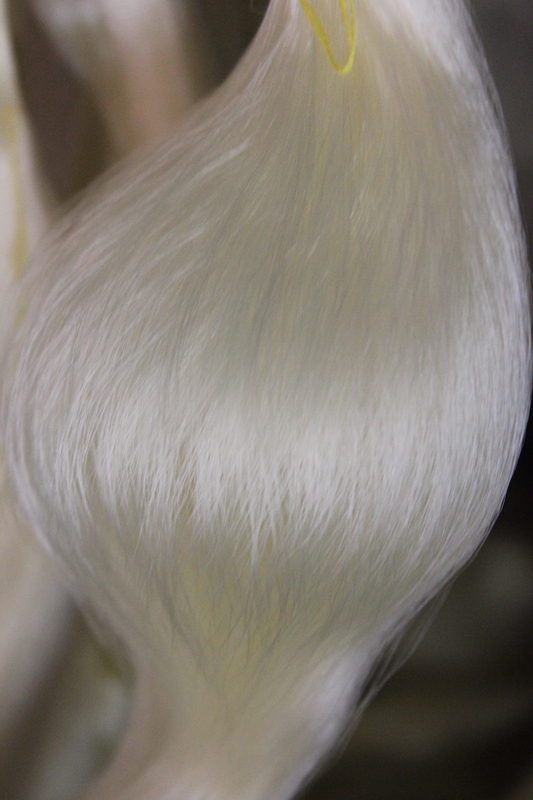 Silk yarn spun after the moth emerges from the cocoon is known as Ahimsa silk. During his time, Mahatma Gandhi vehemently opposed killing silkworm pupae for silk. It was he who suggested production of silk from empty cocoons. A certain amount of wastage occurs when silk is spun from the cocoons. Strands of wasted yarn are also used to weave fabric popularly called spun silk. Dead pupae are used as a source of protein. 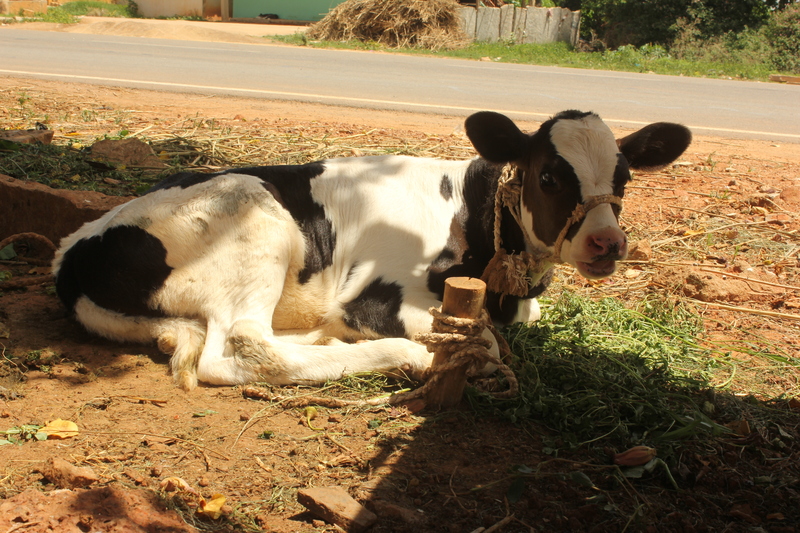 Consignments of them are also exported to South Korea where they are a popular delicacy. After doing a recce of the reeling unit we lunched at the sprawling Silver Oak Farm on the foothills of Nandi Hills. It felt awesome dining amidst the marvelous surroundings drowned in the chirps of birds. A little tortoise here was the centre of attraction. There were a lot of Alsatians too who were enjoying their afternoon siesta. 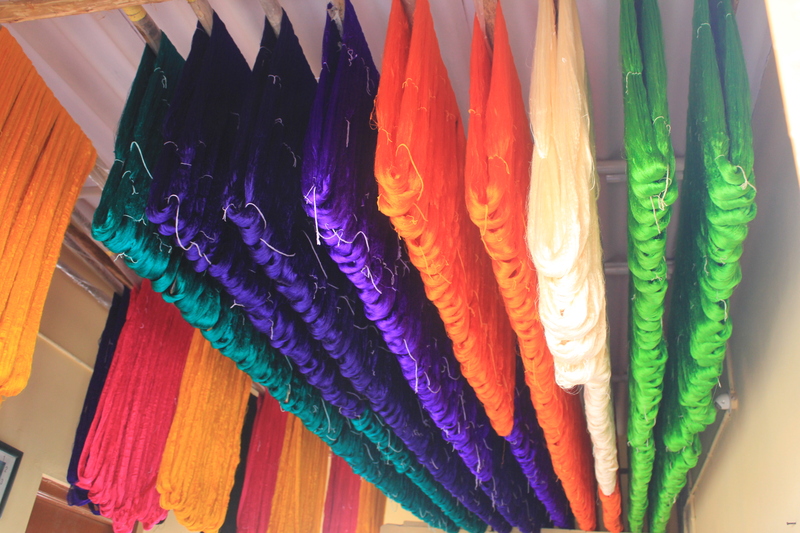 Silk yarn dyed in various hues being left to dry. A hearty lunch later we drove off to a dyeing unit. 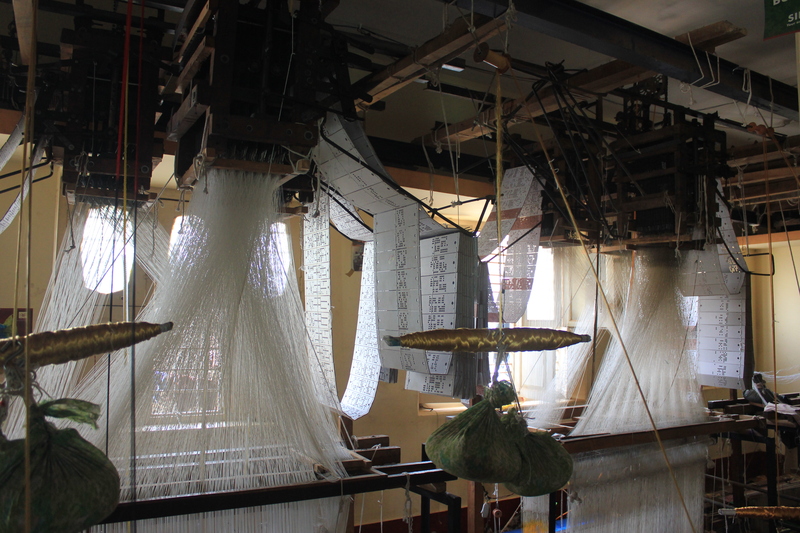 From the reeling units, bundles of silk yarn are sent to the dyeing units (see picture above). Dyed yarn is left to dry in the open and later packed off to various weaving units. 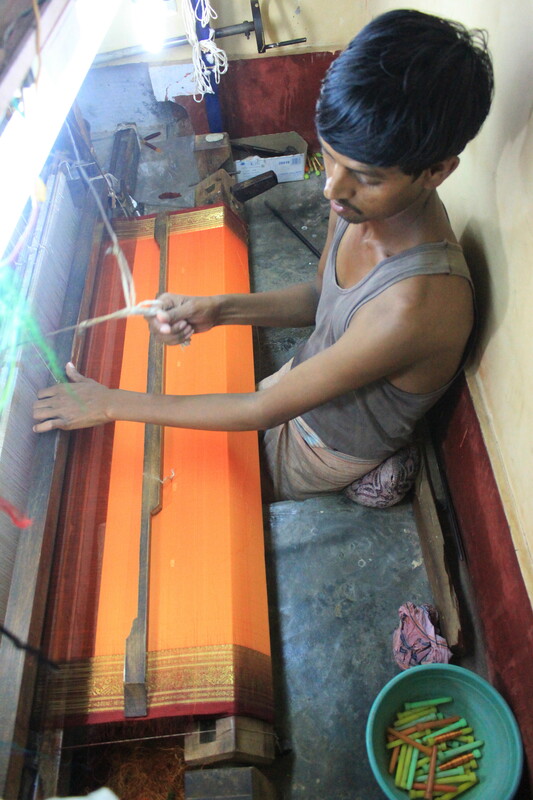 Silk yarn of brilliant hues wound around an axle in the loom. 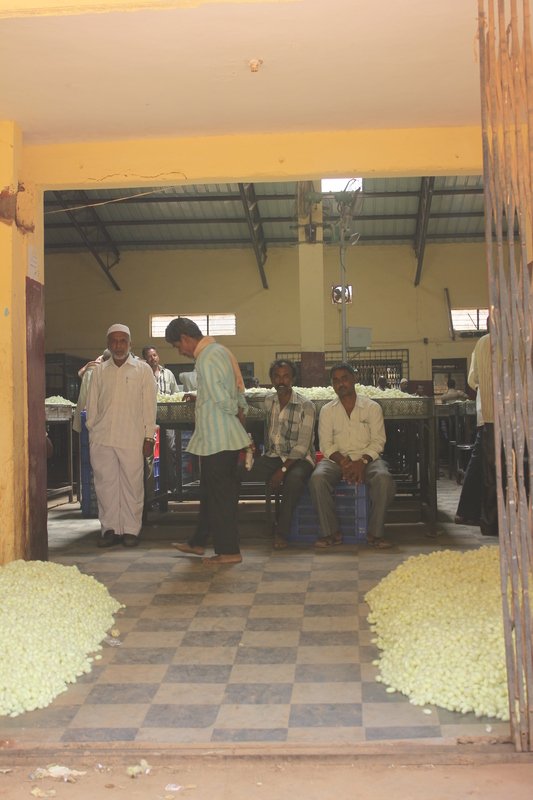 The final stage in the making of silk is at the weaving units. 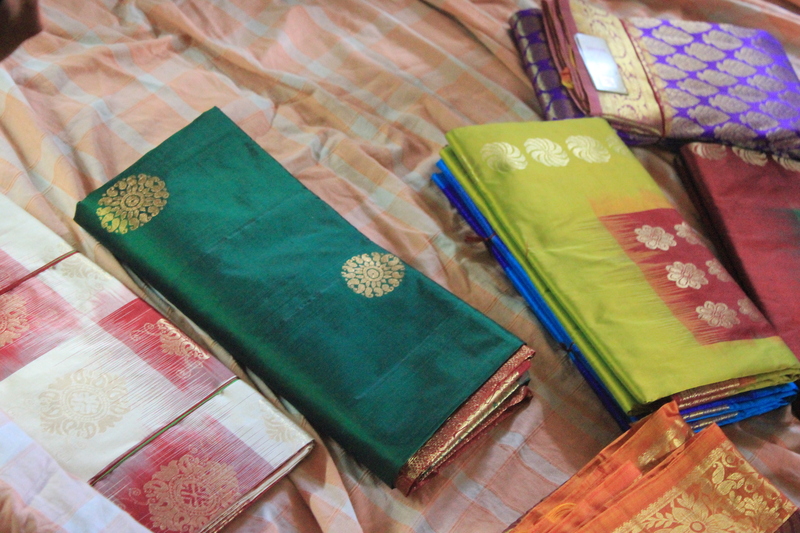 Men and women operate complicated machinery to create spectacular sarees in diverse designs and hues. 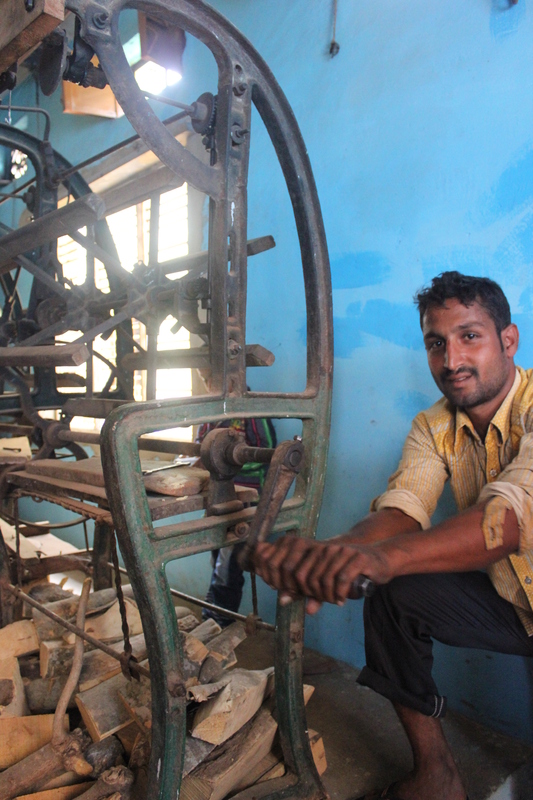 When you look at the looms you can’t help but admire the men behind the innovation. 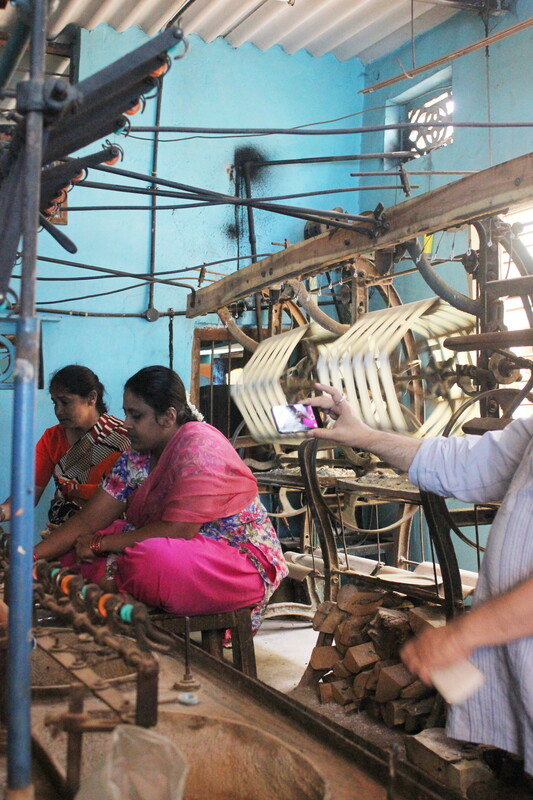 Weavers take around a day to set up each loom for a saree. Looking back at the entire process I couldn’t help but feel sorry for the poor silkworms and the men and women who labour so hard. The only consolation is that sericulture is big business in Karnataka and feed millions of families of our rural brethren. 1. Owing to their immense benefits, the mulberry plant and silkworm are fondly referred to as Kalpavriksha and Kamadhenu, respectively. 2. 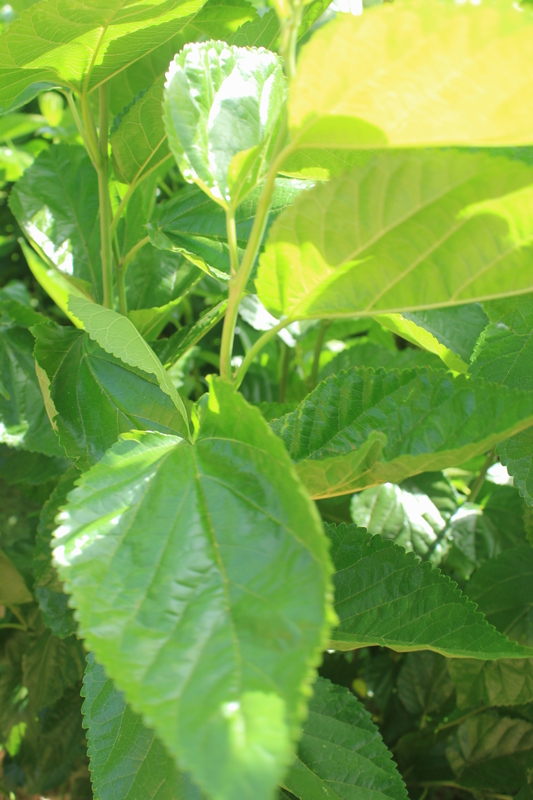 A mulberry plant once planted lasts for nearly 25 years. 3. 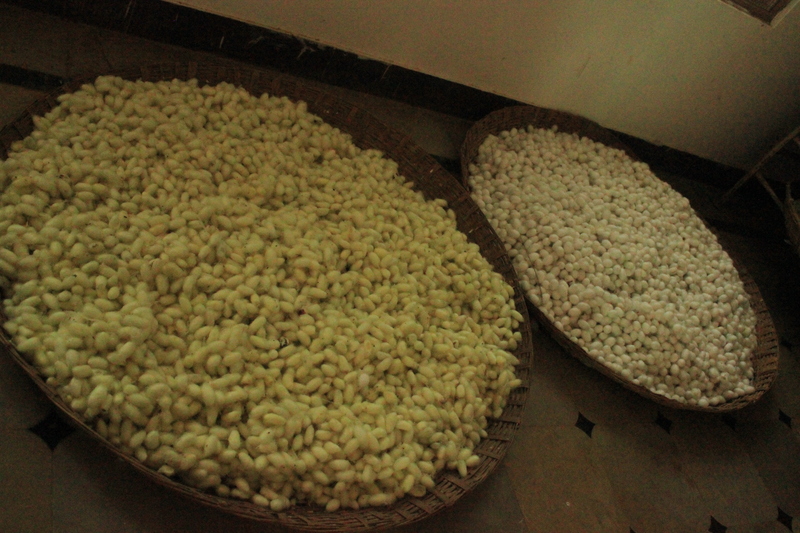 30,000 tonnes of cocoons are required to produce 2200 tonnes of raw silk. 4. The length of a silk filament from a single cocoon is about 500 metres. 5. Mulberry can be cultivated throughout the year. 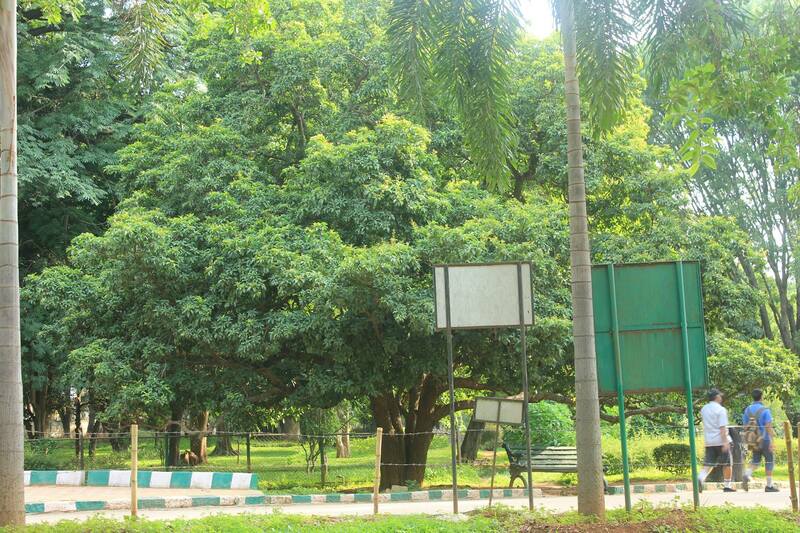 My last Sunday morning started on a green note with a tree walk at Lal Bagh. The walk conducted by heritage walk and tour organisers Unhurried.in started at the West Gate of Lal Bagh at 7am. I was a tad late being used as I was to entering through the Double Road gate. To reach the West Gate I had to take a circuitous route. In spite of that I was the first walker to arrive. That definitely cheered me up because of late I have never reached any destination at the slated time and have earned the reputation of being a notorious latecomer. However, Unhurried’s walk leader for the day Vijayakumar Vittal was already there. A few minutes later, the other walkers joined in and we were off. The fast-paced walk had around 30 stops at different trees and Vijay, a reservoir of knowledge, had anecdotes galore and also many stories to tell us. 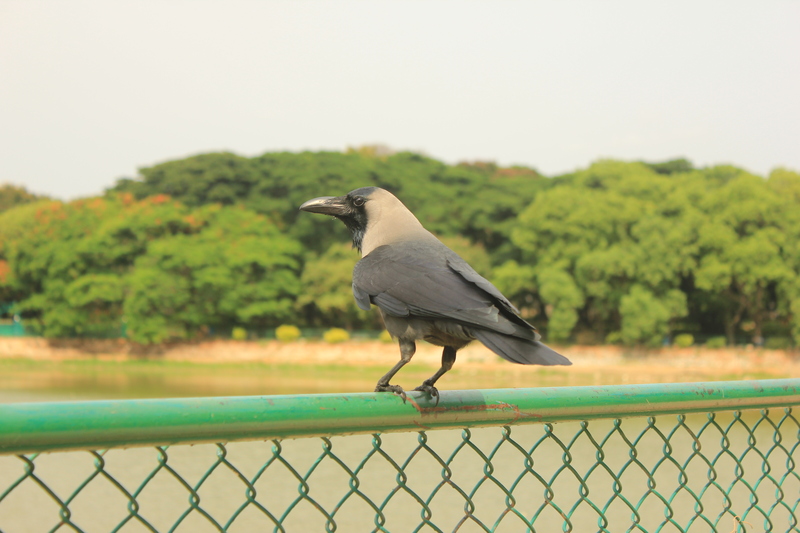 I have been to quite a few nature walks at Lal Bagh. This one was quite different because the emphasis was more on the cultural aspects of the green beauties. Our first stop was under a large banyan tree, India’s national tree, a very auspicious point considering the tree is highly revered in India especially by the Hindus. 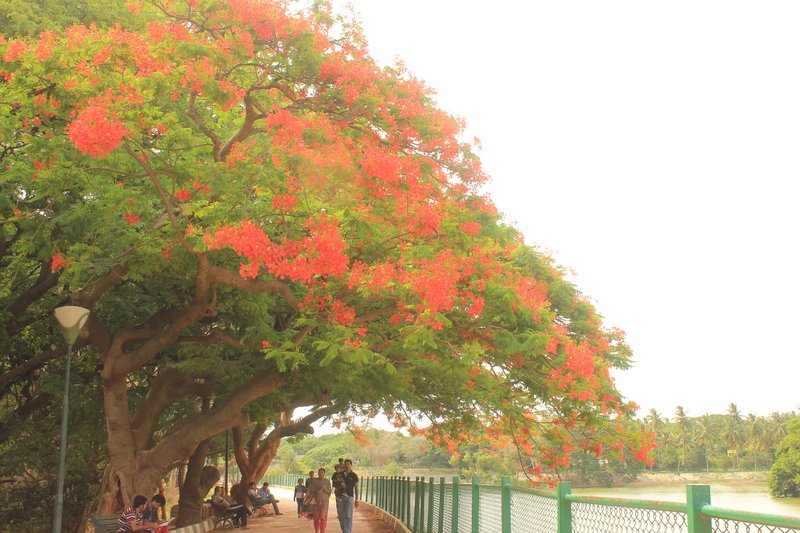 Our guide had a lot to tell us about the tree but not before sharing a brief history of Bangalore and Lal Bagh. The Ficus benghalensis probably derives its name because it thrives in Bengal. Every part of the tree has a medicinal use. Some of these trees live for around 200-500 years. – There is one banyan tree in Haryana believed to be around 5000 years old and popularly referred to as the Bhagavad Gita tree. Legend has it that it was under this tree that Lord Krishna delivered his epic advice or Bhagavad Gita to Arjuna during the Kurukshetra War. – The Bombay Stock Exchange started under a banyan tree. 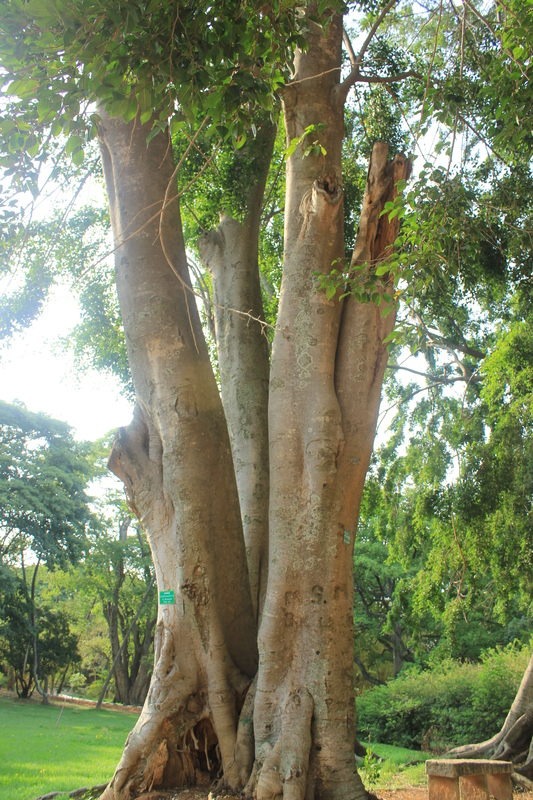 – Dodda Alada Mara or the Big Banyan Tree near Bangalore is a famous picnic spot. – During Alexander the Great’s invasion of India, around 7000 of his men took refuge under a single banyan tree. 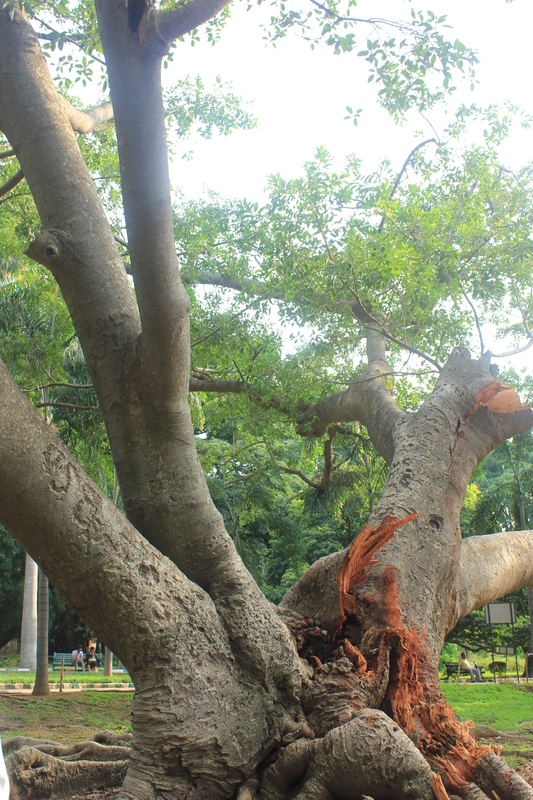 We next moved under the 170-year-old Ficus elastica, or the Indian rubber tree, half of which fell on 21 May because of the hailstorm that lashed this part of Bangalore. Sadly, this species of banyan tree which was once in abundance along the Burma-Bangladesh border has rapidly decreased in number owing to indiscriminate felling for its prized rubber. 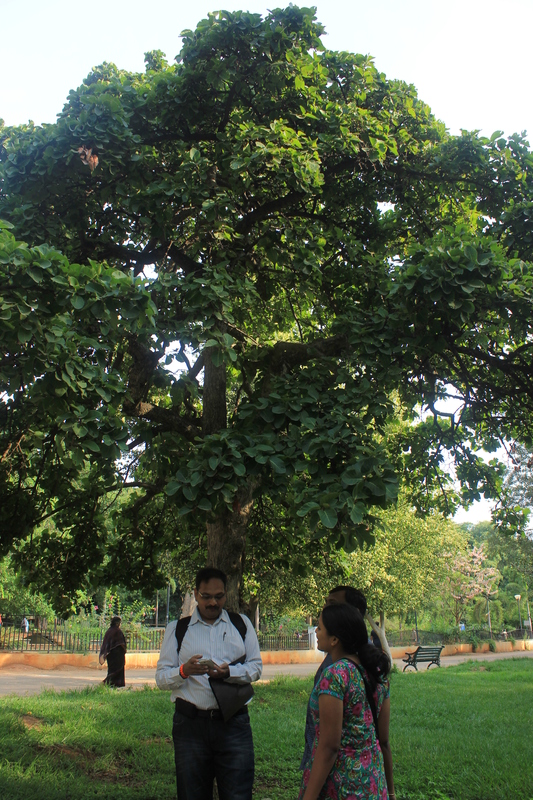 From where we stood we were shown a chikoo (sapota) tree planted in 1861 by William New, the then Superintendent of the Gardens. Now this revelation had me stumped. I found it hard to believe that the tree was more than 150 years old. To me she looked little more than 10. After admiring an elegant Ficus benjamina, a tree known to grow under very poor conditions, we moved to a kadamba tree. 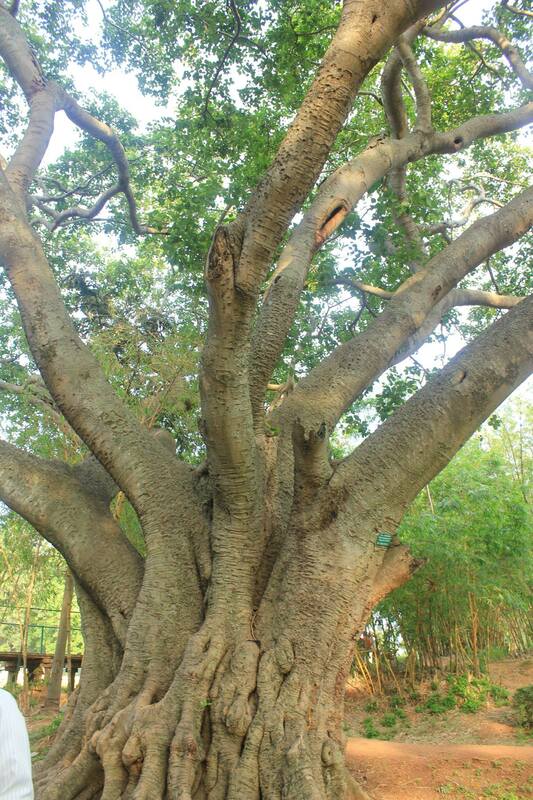 The Kadamba tree is famous in Hindu mythology because it is under this tree that Dhruva performed his famous penance. Also, Radha and Krishna spent a lot of time under Kadamba trees. Goddess Durga is known to stay in a Kadamba vana (forest). Our next halt was at another mythologically significant tree, the Ficus Krishnae or Buttercup tree.The leaves of the tree, a variety of Banyan tree, are cup-shaped. Legend has it that Lord Krishna who was famous for stealing butter during his childhood, would eat butter using these little leaves. 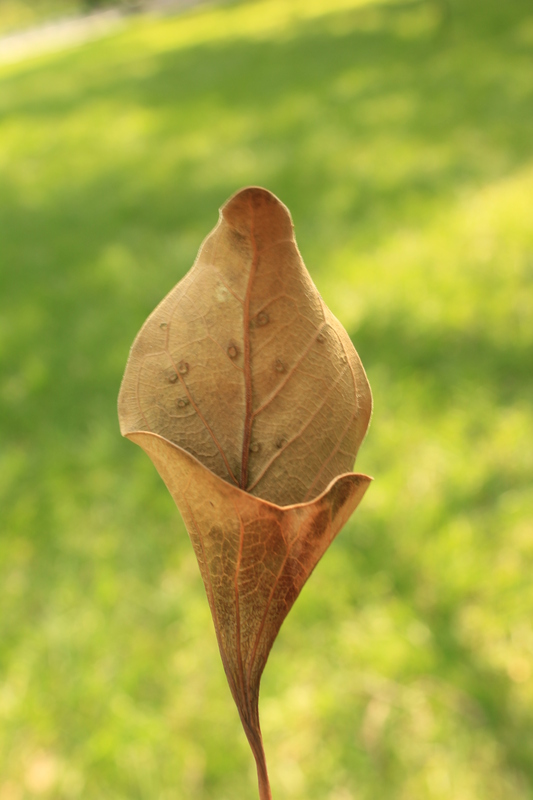 The leaves are also referred to as Krishna’s buttercups. The walk continued with stops and stories at the White Silk Cotton Tree, Baobab Tree, Raintree, Agathis robusta, Ashoka Tree, Mahogany tree, Badraksha Tree, Child Life tree, the Century Palm, Tipu’s Mango tree with half-eaten juicy mangoes strewn around probably the handiwork of squirrels and birds, Malabar Tamarind tree, Elephant Apple tree, Pipal tree and more (see slideshow above). 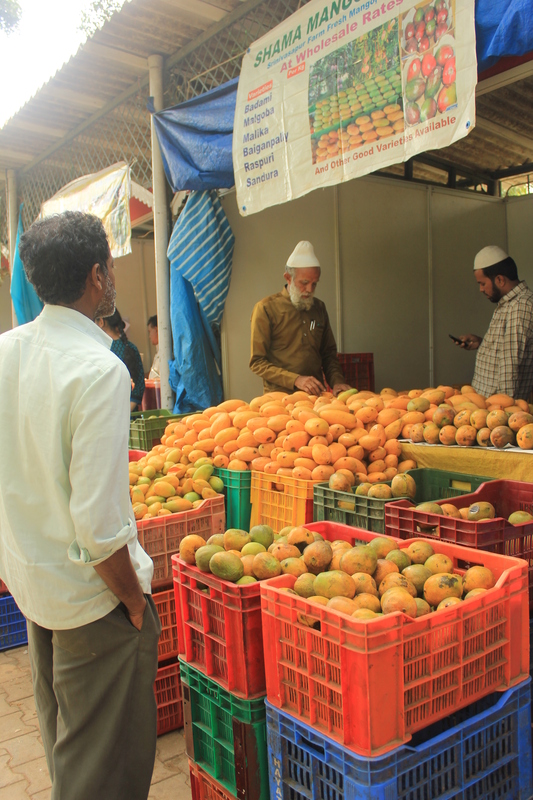 A stop at the ongoing Mango mela gave a mango-twist to the walk. As we walked by the numerous stalls, a mélange of exqusite aromas greeted us. 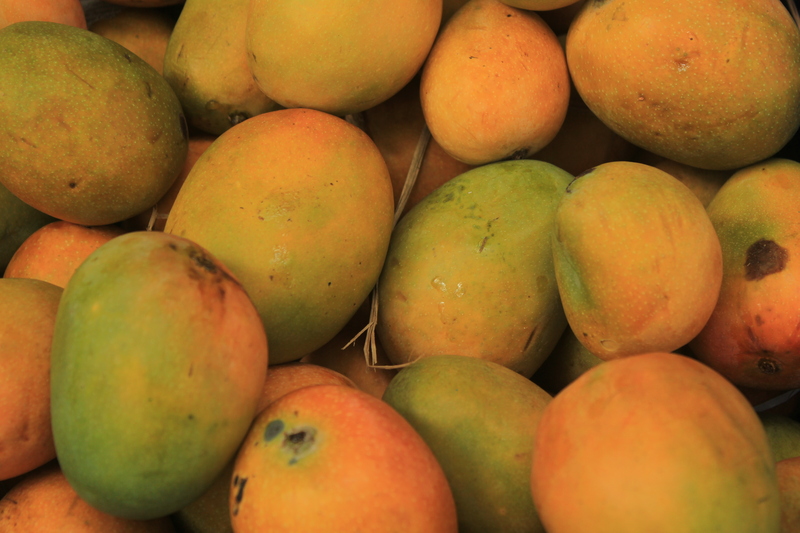 There were endless baskets filled with mangoes of various varieties. Now this is an incomplete story. 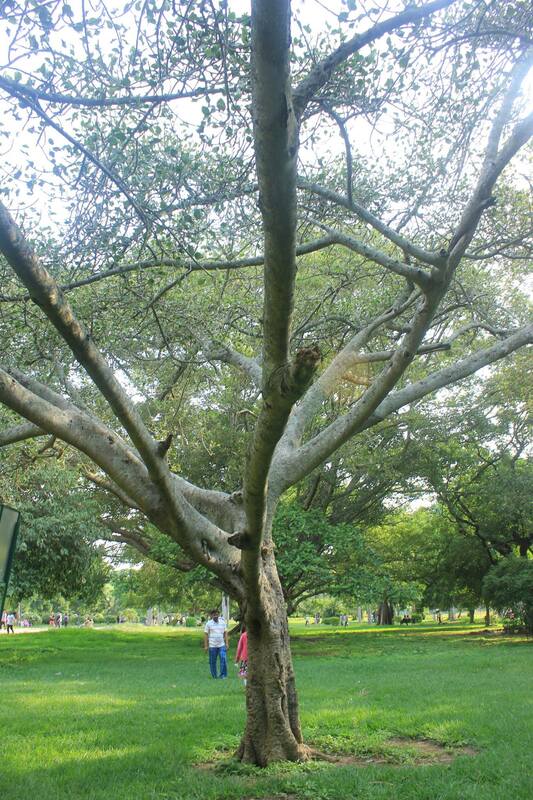 To know more about trees from all over the world take part in Unhurried’s upcoming walk on June 29 and revel in the sun-kissed (or maybe rain-soaked) greenery of Lal Bagh. In case you wish to participate send in your request to poornima@unhurried.in.